Thurston House Times – Maine?! The innkeeper is on a fast trip to York Harbor, Maine to handle a bit of personal business and take a last recharge before what will hopefully be a very busy next few months. This weekend was wild with weather, but things have calmed down and it is beautiful today. I know what comes next so heading home real soon. Come stay at Thurston House bed & breakfast real soon…book now! All rested up and ready to go. I took my last cliff walk this morning. The temperature was only in the 30’s, but crystal clear and gorgeous. As I leave Maine I leave behind many beautiful spring gardens waking up for the season…daffodils, tulips, violets…… Back home to Maitland….. On my way to Boston’s Logan Airport soon. Time for Friends – Life Is Good. If you have wonderful people in your life that have been there a long time, do you ever take the time to get together? Sometimes you just have to leave the “real world” and take the time. We have a group of 5 friends who get together as often as possible. Considering we live in several states, we do pretty good! The “Life Is Good” ladies got together here in Maine this past weekend. We laughed, we cried, we ate, we drank wine…. Three of us have been friends for almost 50 years! Sooooooo…if you have people who mean a lot to you and you haven’t seen them for a while…JUST DO IT!!!! We lost one of us a few years back and learned this very important lesson! If you don’t take the time you won’t get the time. When we get to our Maine place we usually just want to relax, walk along the ocean and not even move the car. Here is more from today. Our unit in this lovely 1877 mansion called “Thorncroft Condominiums”, is the one one the second floor with the little porch. It is not like our huge Thurston House porch, but we like it just fine! Where oh where does an innkeeper go? Occasionally an innkeeper needs to step back and have a time away to recharge. We were thankfully smart enough over 20 years ago to buy a beautiful condo in York Harbor, Maine. 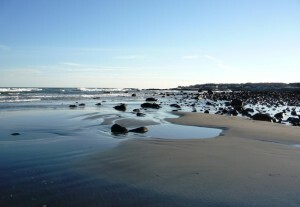 It is an easy trip for us, just over one hour from Boston’s Logan Airport. This is a beautiful area of historic homes, museums, and even a cliff walk that runs along ocean to a little beach. We call this our “Northern Bliss”. I am feeling better already! What does an innkeeper do when life calls us in a different direction for a moment? Take the time!!! A dear friend’s Mom passed away Christmas Day and she was just buried this past weekend. I was blessed to have known her almost 50 years. She was a very special person to many people, and this past weekend’s burial showed that. There was a bench dedicated to her and also to her husband who passed away a few years back. It is at the Holden trailhead of the Wachusett Greenways. This is a wonderful system of trails covering several towns, including Holden where I grew up. People enjoy these trails in every season…hiking, walking, bird watching and cross country skiing. It is all maintained by volunteers, people like our friend’s Bob & Rosalie. It is amazing that “those next door neighbors” and “Cathy’s parents” became “Carole & Joe’s friends” in later years. They are much missed! Did you ever wonder who those people are happily enjoying breakfast on my Thurston House website? Well, now you know!